At the crossroads of Africa, Europe and the Middle East, Morocco is an intoxicating fusion of cultures. You’re guaranteed sensory overload with the vibrant colours, spiced aromas and the taste of 1001 Moroccan treats! Independent travel, without the stress. Peregrine’s Independent Journeys are a range of Peregrine’s best-selling group tours, available for 1-3 people. They depart on any day and come accompanied by a Peregrine local guides in each location, private transfer and 24/7 support from the local Peregrine office. Please note that Independent journeys are not accompanied by Tour Leaders. Welcome to Morocco! On arrival at Casablanca Airport, you will be met by a Peregrine representative and transferred to your hotel. While this is an arrival day and you may arrive at any time, please note that hotel rooms are generally only available after midday, and that there will a Welcome Meeting with your leader tonight. If you arrive with time to spare, then a great option for your limited time in Casablanca is to visit the art deco Villa des Arts. This gorgeous gallery dates back to 1930s and holds numerous exhibitions of contemporary Moroccan and international art. If you are looking for a different type of cultural experience, then you can discover a unique and fascinating part of Moroccan history at the Museum of Judaism. Notes: Please be aware that some of our travellers in Casablanca are being approached by locals offering excursions before their Peregrine trip commences. This has been particularly prevalent in and around the hotels used by Peregrine. These guides are in no way connected to Peregrine and we cannot guarantee the safety or quality standards of their tours. We strongly advise customers not to join any tour offered by unauthorised guides. Peregrine assesses the safety of all optional excursions offered by our tour leaders. If you would like more information on the excursions available, please contact us before you travel or see the Peregrine branded notice in the reception of your hotel. This morning you will visit one of the most impressive sites in Casablanca – the massive edifice of the Mosque of Hassan II. Opened in 1993, and second only in size to the great mosque at Mecca, the huge building is part on land and part on sea, and in one area water can be seen through a glass floor. It can accommodate 25,000 worshippers and the main roof is retractable to create an open courtyard. It is one of the only religious sites open to non-Muslims. Later, you will leave Casablanca and drive north along the coast to Rabat (approximately 1.5 hours), the elegant capital of Morocco and its first Imperial city. It contains numerous fine Arab monuments, some dating from the 10th to 15th century Almohad and Merenid dynasties, and others that are far older. The earliest known settlement is Sala, occupying an area now known as the Chellah, where you will visit the remains of the citadel. You will also see the vast minaret of the Hassan Mosque and explore the lovely walled quarter known as the Kasbah des Oudaias. In the late afternoon, continue on to Meknes (approximately 2 hours), the sixth largest city in the kingdom, and former capital of Morocco. 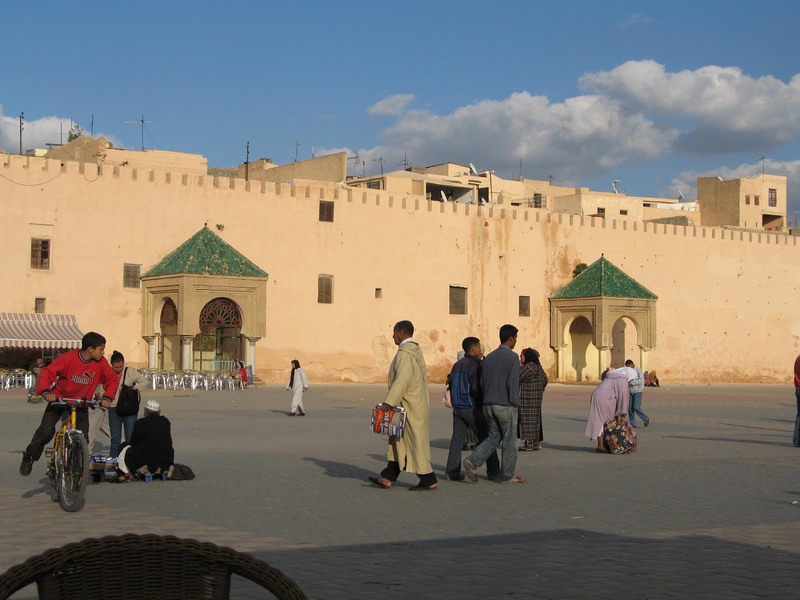 This morning you will discover the charming streets of Meknes’ medina – the old walled section of the city. Enter via the northern gate, Bab Berdaine, and walk to the shrine of Moulay Ismail who, in the 17th century, turned Meknes from a provincial town to a spectacular Imperial city. You will explore the elaborately decorated public buildings hidden in these winding streets, including the lovely Bou Inania Medresse (religious school). Take some time to soak up the bustling atmosphere of the old souk before driving out of the city to the ruins of Volubilis (approximately 45 minutes). Volubilis was once a provincial Roman capital, a distant outpost of the empire, and the remains make an undeniably impressive sight. Volubilis is the foremost Roman site in Morocco and was declared a World Heritage Site in 1997. Upon arrival you will take a tour around the ruins with a local guide. Please remember to pack drinking water, hat, sunglasses and sun cream for this tour as it may get hot and you will be exposed to the sun. And, of course, don’t forget to take your camera as the town is filled with fantastic mosaics along the Decumanus Maximus, many of which remain intact. After time spent imagining Volubulis as the bustling city it once was, continue on to the living museum of Fes for the night (approximately 1.5 hours). After checking in your hotel in late afternoon, the balance of the day is free for you to enjoy. Fes is the spiritual and cultural heart of Morocco; vibrant, noisy, fascinating and overwhelming – a visual and pungent feast for the senses. It is made up of three distinct ‘cities’, or quarters, and you will stay in elegant, riad-style accommodation on the edge of the huge, well-preserved medieval old city – the mother of all medinas. Today head into the old city, known locally as Fes el Bali, arguably the world's most fascinating and confounding old city. Medieval Fes was one of the world's great centres of education and culture, both Islamic and Jewish. Its religious institutions and libraries are legendary, its mosques of great renown. Walk through the twisting streets and alleyways, passing donkeys piled high with goods, and explore the specialty sections that divide the souk. Filled with historic khans, medresses and dye-pits, stalls loaded with fruits, herbs and soups, and where the squawk of chickens, smell of spice and sound of hammering of copper fills the air, it’s not hard to imagine yourself back in the Middle Ages. Spend the day exploring the old city, visiting, Mederassa Bou Inania, the tanneries and the splendid Funduk Nejjarine, a beautifully restored 18th century inn. Return to your hotel in the late afternoon and enjoy a memorable dinner of one of the city’s signature dishes, the salty and sweet pastille. This morning there's time to haggle for carpets (mainly Kilims), take another refreshing walk, or visit a nearby Franciscan convent where local girls and women learn weaving, tapestry and embroidery. Drive through changing scenery, from barren mountainsides to fertile valleys, on the journey to Merzouga. With a backdrop of the orange-coloured Erg Chebbi sand dunes, the charming Saharan village of Merzouga feels wonderfully isolated, like the modern world has left it behind. The Erg Chebbi dunes are the most stunning in the country and an essential part of any visit to Morocco. An erg is a vast sea of shifting wind-swept sand that's formed into picturesque, undulating crests and valleys. The Erg Chebbi is one of the world's iconic landscapes, with towering dunes up to 150 metres in height. Located at the end of a sealed road and just 20 kilometres from the Algerian border this really feels like frontier country. You will leave your gear at a simple auberge and then ride camels into the edge of the Sahara Desert, enjoying a spectacular sunset along the way. The dunes are stunning, especially as the evening light plays across them and sets off the colours. Tonight you will camp out in traditional style, with the chance to try some fantastic local cuisine while you sit around an open fire. Stay late after the dinner, enjoying lively music, drumming, Bedouin stories and dancing under the stars. Notes: The camp is set up for private use of our group. You will enjoy the comfort of private tents, with proper size standing beds, coffee table and chairs. Each tent has a private shower and toilet provided. While there is also a dining tent provided, most travellers prefer to dine outside, under the stars and sitting around an open fire. Blankets and mattresses are provided, however, during the cold winter months from November to March, you may consider bringing your own sleeping bag for extra warmth and comfort. 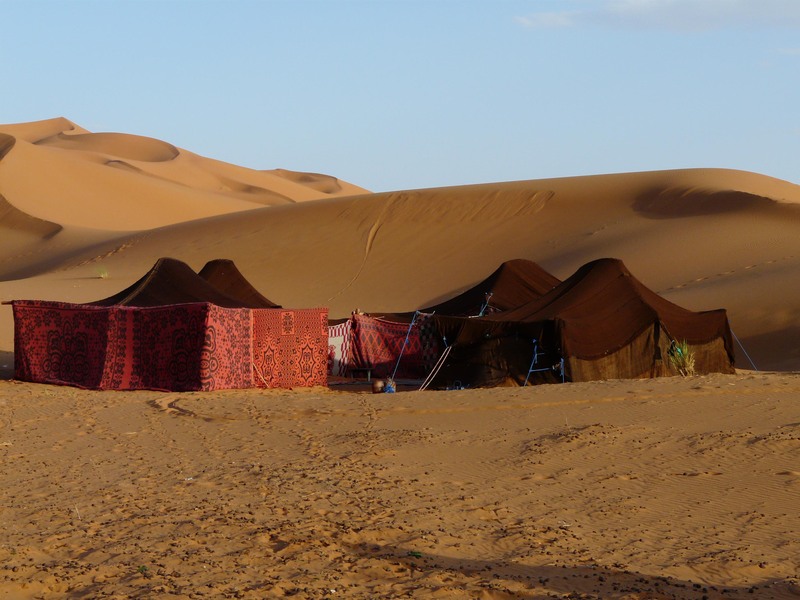 The entire camp is set up by our crew while you relax and enjoy the mighty Sahara desert. Enjoy a real Lawrence of Arabia moment this morning with a sunrise camel ride across the desert on the return journey to the auberge. Then drive to Todra Gorge (approximately 3.5 hours), a massive trench that rises over 250 metres to form one of the most dramatic and spectacular natural sights in Morocco. The limestone stacks make a perfect area for trekking, and so today you will take a short walk through the sheer cliffs. Then continue on to the beautiful Dades Valley (approximately 1 hour), where you will stop for a break and have some time to take in the remarkable scenery – sprawling green valleys and rocks sculpted into stunning formations by the wind. Continue your journey inland for tonight’s destination, M’goun (approximately 1 hour). You will get closer to the customs and lifestyle of the Berbers this evening with the night spent in a traditional Berber house. Enjoy traditional Berber food and hospitality with an exclusive stay with a local family up in the High Atlas Mountains, overlooking the crowning peaks in the distance. 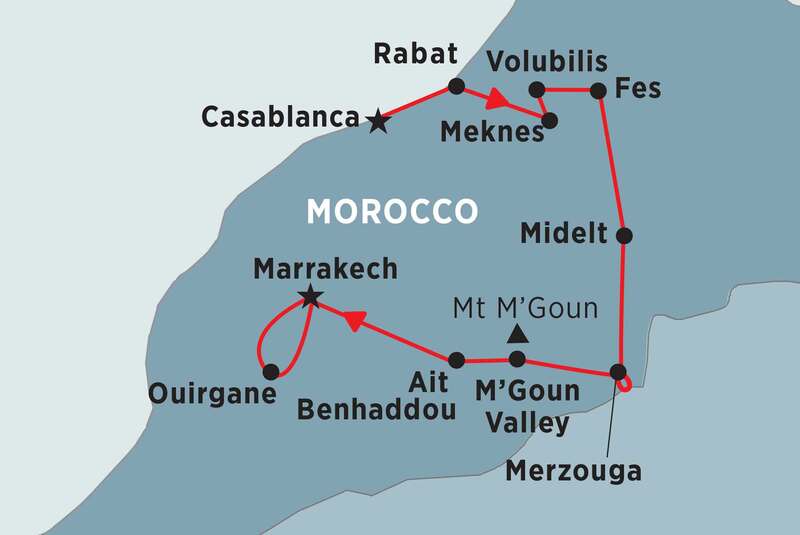 You have a full day to explore the beauty of this largely untouched Moroccan backcountry. On foot is the best way to discover the natural and man-made landscape and the rural way of life. There are a couple of circuits to choose from, but the most popular choice, and the one we recommend, is a 10 kilometre circuit that will take about four hours. Accompanied by a local guide, you’ll walk a trail that undulates slightly here and there, but isn't too challenging if you have a basic level of fitness. 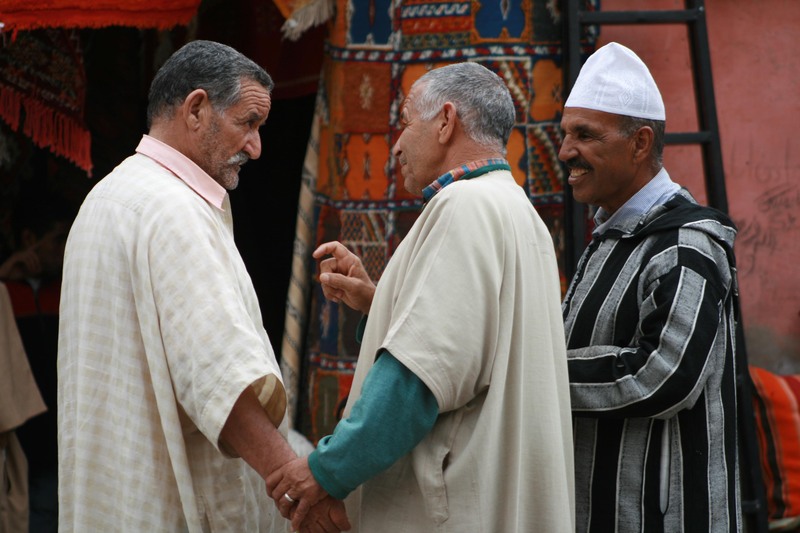 On the walk you'll pass Berber villages, meeting local people along the way. You will learn the tea making secrets of Berbers at the exclusive demonstration with a local family. Listen to their stories and discover the way of family life in M’goun Valley. The surrounding mountains and the famous Rose Valley make a sensational setting. Leaving the Dades Valley today, set off on the fabled ‘Road of 1,000 Kasbahs’. The first stop is at Skoura Oasis (after approximately 1 hour), home to several privately owned kasbahs. Here visit the Kasbah Ameridhl, with its extravagant decorations and mud-brick fortifications. Continue on your journey to Ait Benhaddou (approximately 1 hour). Perched on a hilltop and almost unchanged since the 11th century, Ait Benhaddou is one of Morocco's most iconic sites. Its grant kasbah is one of the most beautiful in Morocco and the fortified village is a fine example of clay architecture. If you think you recognise the place, you probably do, as the town has a long list of film and TV credits, including Lawrence of Arabia, Game of Thrones and Gladiator. Enjoy a walk through the winding streets of old town, making your way to the top of the hill, from where you can enjoy the views across the surrounding plains. After heading to your nearby hotel for the night, maybe sit back on the roof top terrace and watch the sun setting over the magical Kasbah. Leave Ait ben Haddou after breakfast and drive for several hours through the winding roads of the Atlas Mountains. We can take our time as the scenery is magnificent and keen photographers may call for a few photo stops! Our destination today is Ouirgane, small town and rural commune in Al Haouz Province of the Marrakesh-Tensift-El Haouz region of Morocco. Nestled in the tranquil foothills of the High Atlas Mountains in the heart of the Toubkal National Park lays this pretty Berber village that provides the visitors with an alternative and lesser-visited base for walking. With its gentle winter climate and moderate summer, it is a great place to stroll around the nearby red-earth hills and pine forests, watch a wide variety of bird life or just sit back and relax at an invigorating altitude of 1,000 metres - all that with the amazing view of Jebel (Mount) Toubkal in the background. Today you will drive for couple of hours through the winding roads of the Atlas, bound for Marrakech, an ancient, exotic city wrapped in European modernity. There’s no rush as the scenery through the High Atlas Mountain passes is magnificent, and there will surely be calls for several photo stops along the way. On arrival in Marrakech you will check in to your beautiful riad, or Moroccan mansion; beautifully decorated, cosy yet historical. This evening, why not head to the great square of Jemaa el Fna, one of the largest public spaces in the world and unique to Marrakech. When night falls it transforms into a hive of activity. Henna-painters, performers and storytellers share the square with a street food bazaar, packed with stalls loaded with Moroccan delicacies. Enjoy a bite of famous Moroccan pastries with a glass of freshly squeezed orange juice, and then finish your day with a cup of tea on one of the roof-top restaurants overlooking the square. After breakfast today, meet your local guide and set off on a morning tour of the old medina, through the bustling souks that are the lifeblood flowing through the city. Explore tranquil courtyards filled with the scent of orange blossom, and the many salons and chambers that make up Bahia Palace. This splendid mansion was built in 1866 for a former slave who rose to power within the government. Continue to the Marrakech Museum, itself a former palace, which houses a fine collection of Moroccan art and sculpture. Stop by the Koutoubia Mosque; its famous minaret is the prototype for others of its kind around the world, including La Giralda in Seville. Then walk back through the streets of the old medina to the Jemaa el Fna. The rest of the day is free to explore further or shop in the bazaar. Perhaps visit the tropical gardens of the French painter Jacques Majorelle or check out the ruins of the Palais Badi, once one of the most beautiful palaces in the world. Otherwise, perhaps head back into the medina, where every step brings a new smell, a new sight or a new gift to buy. Watch skilled artisans perfect their craft, practice your haggling skills or take a break from the hustle to sip on tea or share a tajine, filled with the pure scent of Morocco. For your final evening, why not feast with new friends in one of the many great restaurants lining the square.